Regulation is defined as the intentional influencing of a subject’s behavior. Law is for certain the most obvious example of this, but other mechanisms achieve the same result: moral and social norms, authorities and institutions, market and organizations to name a few. Over the past decades alternative approaches and labels such as “smart regulation”, “responsive regulation” or “passive regulation” have been elaborated to depict a wider array of tools to be used to tackle this task. In particular some areas of modern socio-economic interaction seem to require a switch from a ommand-and-control legislation and enforcement, typical of the classical democratic setting, to a kind of co-regulation and participatory governance of the legislative process involving external players, who do not belong to the State institutions, called to intervene. Technological innovation certainly represents a case in point. Not only does it develop in a transnational context, being the purport of the cooperation of articulated research teams spread over the globe, but it is also, by its very nature, a cross-boundary-phenomenon, which runs across jurisdictions most often extremely distant from one another, even with respect to axiological choices. Hence a traditional hard law approach frequently appears to be inadequate, while soft law may be preferable. In the framework of the RoboLaw project (Regulating Emerging Technologies in Europe: Robotics facing Law and Ethics), funded under the 7th FP, and building on the results of the workshop that took place on June 2012 at the Scuola Sant’Anna in Pisa, this book focus on the prospect of regulating technology and innovation, in general terms and with regard to different types of technologies. 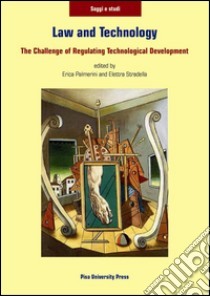 Among the contributors, reflecting on the theoretical perspectives and multiple dimensions of techno-regulation, and adopting case-scenario approaches in diverse relevant fields, are Stefano Rodotà, Bert-Jaap Koops, Fabrizio Cafaggi, Astrid Zei, Amedeo Santosuosso, Gurvinder Virk, Alessandra Arcuri, Anton Vedder.